That time of year is approaching us again: weddings, graduations and celebrations of all proportions. Dental offices usually see a spike in interest with patients inquiring about attaining whiter smile. Let’s be honest, who can blame them? Nothing goes better on your big day than your whitest smile. Let Sugar Fix Dental Loft help you on your way to a whiter smile. Look at that GORGEOUS white smile from a Zoom procedure! It’s the perfect spring accessory! Patients often ask about the different ways to whiten and what would work best for them. Well, because we love our readers so much, we’ve created a quick rundown of 3 highly suggested forms of teeth whitening. For patients who have whitened in the past and are looking to “touch-up” the shade of their teeth, at home whitening would be a good fit for you. This can be done a few different ways. The best results are achieved by having Dr. Emery make a custom fitting set of trays with the accompanying professional strength whitening gel to put in them. You might also use a form of over-the-counter teeth whitener like Crest White Strips or an at-home kit with a “make your own” style of mouth tray and gel. These products tend to provide the lowest level of results versus what your dentist can provide for you. All take-home whitening products can take 2-4 weeks to produce results that often are paired with sensitivity as a common side effect. Whitening your teeth with ZOOM is perfect for someone who has never whitened before and is looking to bring their teeth to their brightest potential as quickly as possible. This procedure requires 2 hours in the dental office and you’re done! ZOOM whitening is ideal for patients that are short on “free time” and are concerned with tooth sensitivity. ZOOM is the LEAST sensitive way to whiten your teeth. There are patients that have deep staining, fluorosis, or tetracycline staining that are ideal candidates for this type of whitening. The KOR process can take up to 2 months and consists of a combination of in-office and take-home whitening. The results are undeniably gorgeous and cannot be produced by other products due to the stubbornness of the particular stain. 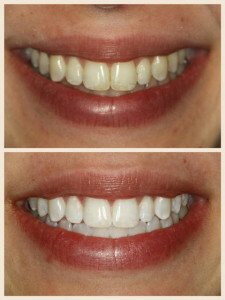 Any way you choose to whiten, we are sure you will be happy that you did. It can be the easiest, fastest way to boost your smile, confidence, and your day. All of the listed treatments are available through Sugar Fix Dental Loft; we’d LOVE to help you brighten your smile!